Public hearings into amending Section 25 of the Constitution wrapped up in Gauteng over the weekend, with only the Western Cape to go. The EFF line continued to dominate while speakers highlighted the complexity of the land question. Parents and their children stood outside Tshwane’s Heartfelt Arena on Saturday morning handing out flyers ahead of the hearings on amending section 25 of the Constitution. 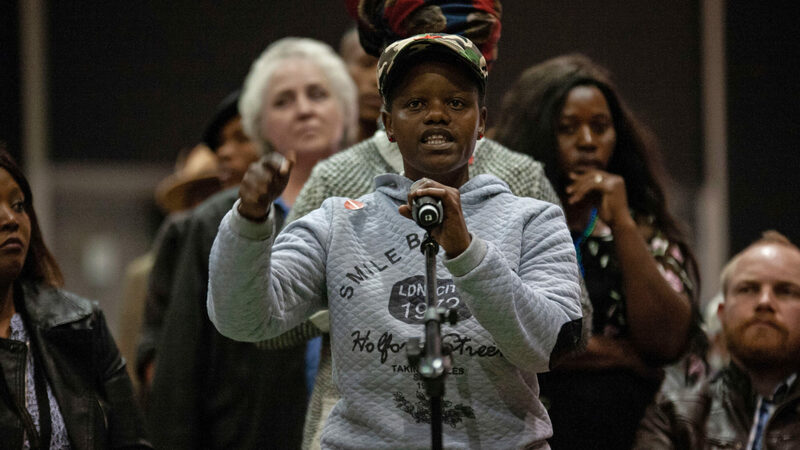 In English and isiZulu, the NGO Umphakathi Okhathazekile outlined its concerns on the proposal to promote land expropriation without compensation. “You just get the decision it’s all a frenzy. It’s not an informed decision,” said Cobus Greyling, a member of the group, which focuses mainly on youth drug rehabilitation. Parliament’s review committee has heard public submissions on changing the Constitution in all provinces but Western Cape, where the committee will go this week. Like in many other provinces, Gauteng continued to hear strong support for expropriation at the highly politicised events. The EFF has been the most organised group at the hearings, with the largest representation. Its position was continuously repeated. Land should be expropriated without compensation and placed under the custodianship of the state to redress past racial injustices and provide housing and economic opportunities for poor black South Africans, with all citizens, including whites, then being able to lease land from the state in a similar fashion to mining companies gaining mineral resources rights. Expropriation without compensation was also supported by some in the ANC. Mzwanele Manyi, the sometimes controversial chair of Afrotone Media Holdings, owner of the news TV station Afro Worldview, spoke on Saturday. 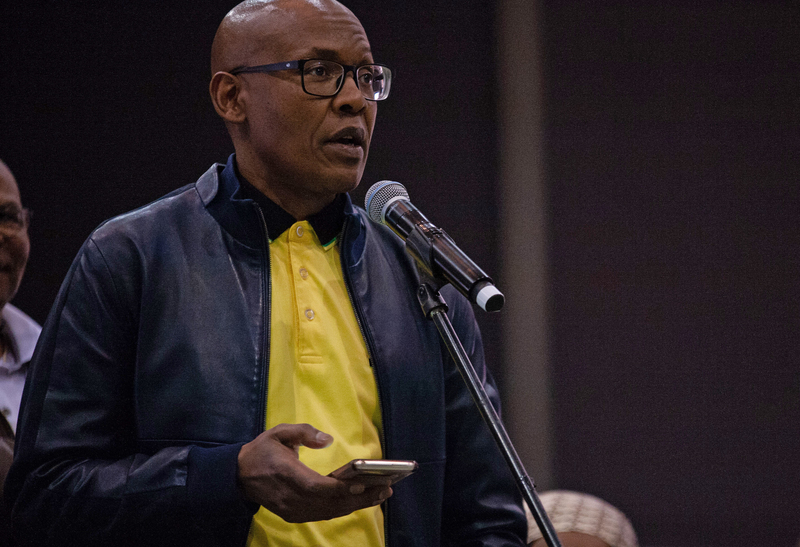 Manyi, also chair of the Progressive Professionals Forum, said the resolution passed in Parliament in February supported land expropriation without compensation in principle and therefore the law must immediately be reviewed and land claims dating back to 1652 should be able to be lodged. Another ANC supporter who introduced himself as Solly Tabatha from Olievenhoutbosch supported the amendment. He cautioned the public that some black South Africans are betraying each other by opposing the law change. He called for all parties in Parliament who represent black voters to unite and to amend the law. The ANC’s position on amending the Constitution remains unclear. Like many things within the party it appears defined by factionalism, with certain leaders offering vague support but suggesting it could be harmful to the economy. Others have fully backed the proposal under the ongoing theme of “radical economic transformation”, and some are unsure of which line to take. White farmers and the DA have consistently spoken against the expropriation of land without compensation, expressing concerns about the economy, food security and general property rights. AgriSA’s Willem Pretorius said white and black South Africans must find a way to discuss the matter and recognise different perspectives and relationships with land. “You cannot in a sense take something from me if you don’t give something back to me,” he said. The obvious response, which was repeatedly mentioned and occasionally disputed, was that whites took land from blacks in the past. Some speakers also noted their distrust of the ANC government. Peter Moatshe, 77 and from Brits, said the ANC has had a majority in Parliament since 1994 but has no interest in representing the poor as the system is set up to serve leaders of the party. He called for the proportional representation system to be converted to a constituency based system and for coalition governments to take control. “This is a formality,” he said outside the hearings, after telling voters to challenge the ANC. Doubting the government’s commitment to land reform, he said the public should first have been briefed on the successes and failures in the past to help make a more informed decision. “The land is being profitable to the people of South Africa… Look over there at that land,” he pointed to vacant land in the distance. “If there is more land of such nature, why don’t we occupy it? “Let us not allow one person to occupy land at the expense of the majority,” he continued. Mohapi cautioned that expropriation without compensation should be implemented slowly and only when it’s a “sure win” rather than in a way that’s haphazard and potentially damaging. 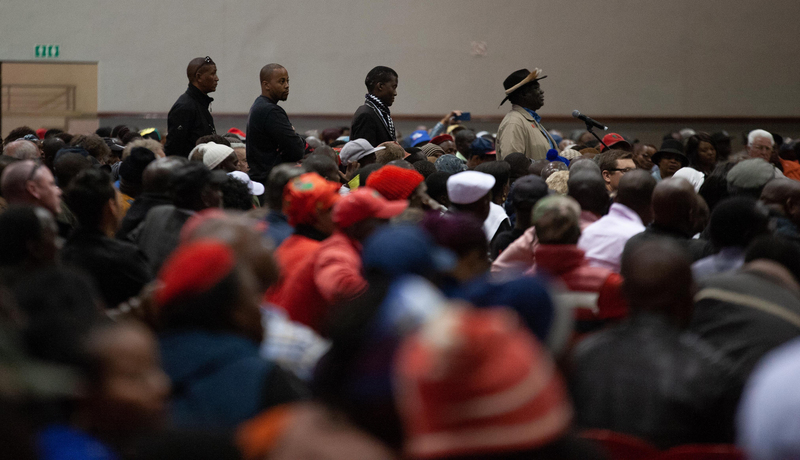 Committee chair Vincent Smith, from the ANC, has repeatedly had to remind speakers to stay on topic as they aired various grievances about the state of South African society and the economy. But the land issue is so complex, emotive and closely tied to other challenges in the country that it’s inevitable that speakers will raise a range of topics. The issue of traditional leadership’s role in the discussions and proposed reforms of land distribution and ownership has come up often. 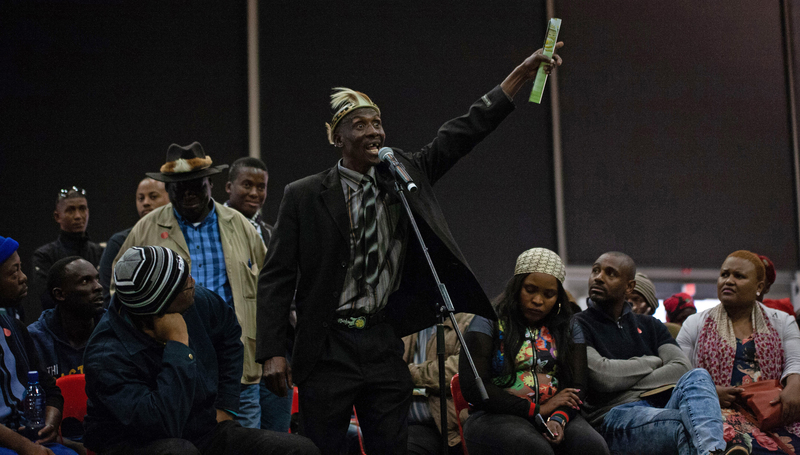 Traditional leader Gilbert Mamogobo, from Bronkhorstspruit, questioned the whole process. He claimed the government should have first spoken to traditional leaders across the country before coming into their areas and taking views from the public. President Cyril Ramaphosa visited Zulu King Goodwill Zwelithini, who has threatened to revolt if his Ingonyama Trust is dissolved, but had failed to speak to other leaders, showing disrespect and favouritism. “The government must give us back our land,” said Mamogobo. “You must give the chief back his land and after that I’m going to manage it with peace,” he said. He called for all land to be in the hands of traditional leaders who would then manage it. With the country’s contested history and complicated present there are no shortages of claims to ownership when the question of land ownership is raised. Greater Aboriginal Community Council of SA leader Larry Varrie supported expropriation but said the current 1913 cut-off date on claims must be expanded and the Khoi-San must be consulted before the government makes any decisions. “There must be no limitation in terms of time. We are the owners of the land since time immemorial,” he said.